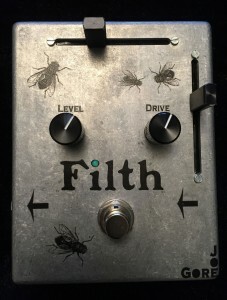 My Filth Fuzz pedal is finally in production and will be shipping within a few weeks. It’s one of three new pedals I’ll be showing at this week’s NAMM show in Anaheim, California. I just finished the demo video, and I’m stoked about how it’s sounding. I’ll also be debuting three other new pedals: Gross Distortion, Cult Germanium Overdrive, and Boring Boost & Buff. Filth, Gross, Cult, and are finalized and in production, and should be available from my partner, Vintage King, sometime in February. (Vintage King is also currently the sole vendor of my Duh Remedial Fuzz, released last year.) We’re still working out a minor bug in Boring, but it should arrive soon after. Filth Fuzz was created in San Francisco and is built in Michigan by skilled craftspeople earning a fair wage. 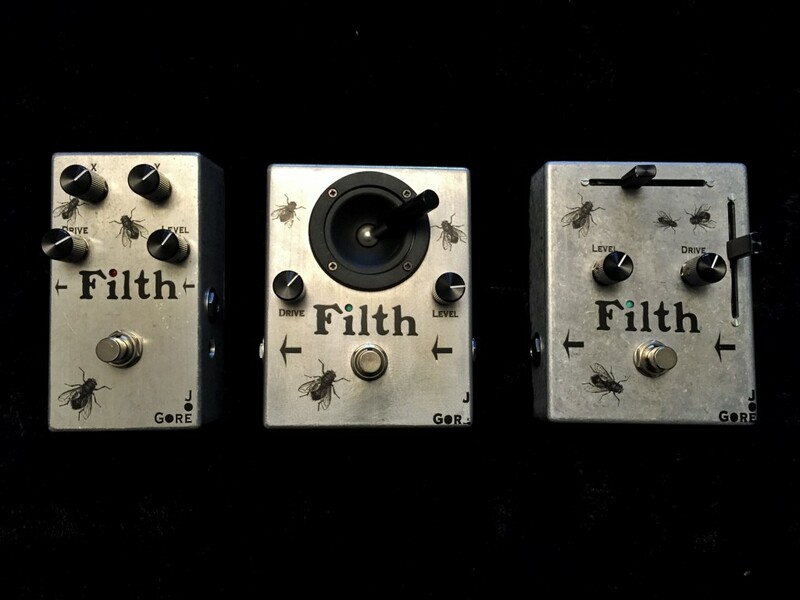 Three incarnations of Filth Fuzz (in order of appearance). To dial in tones on Filth, you adjust two highly interactive pots (let’s call them x and y), which tweak the voltages going in and out of the transistors, providing many tone variations. The original version used two standard pots for these x/y controls. It worked okay, but the ergonomics weren’t ideal. I’ve found that the fastest way to refine sounds is to move both pots at once over a sustained note or chord, and it was just a bit awkward having to take both hands off the guitar to turn the controls simultaneously. So I decided to employ a joystick, which lets you adjust x and y with one hand (and it looks pretty bitchin’). The ergonomics were great, and I thought we’d finalized the format. But then I showed a joystick prototype at the L.A. Amp Show in October, and for the first time I had a chance to sit back and watch other guitarists interact with the device. Players seemed to have a blast with it, but I kept noticing how often a heavy stompbox foot would land perilously close to the joystick’s none-too-sturdy shaft. Then Miko Mader, a clever guitarist who works for my distributor, M1, came up with the perfect solution: Why not use two sliders instead of pots? Tony at Cusack sourced the perfect part, and we prototyped a third version. I’m really stoked about this pedal. I hope you enjoy it as well. seriously, no comments yet? 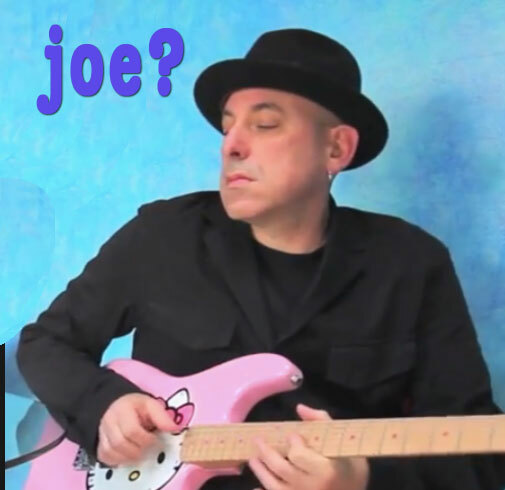 It sounds great Joe! I love how tight and balanced it is. Typical use aside, I could envision that being a great unit to have between the guitar and a recording preamp for itb processing – a bit of grit, a bit of compression, and a lot of thick tone. Nicely done! Which reminds me, your old two knob bulk fuzz is almost permanently on in my minimal pedalboard – knobs about 60% – just enough to add a little excitement to the signal. Every couple weeks I notice that it’s on, then turn it off for a few minutes, feel like I’m missing something, then turn it back on and forget about it for another couple weeks. 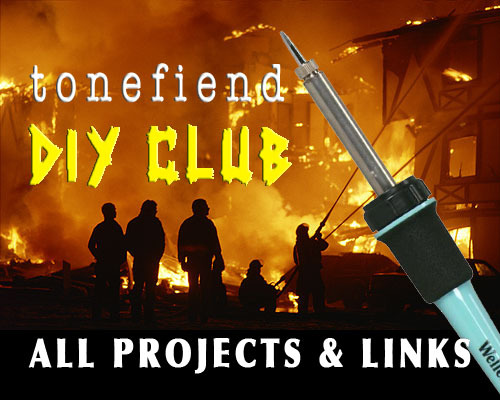 I can’t take any credit for the Bulk — it’s just a popular DIY circuit (though I did steal one little trick from it for my Duh fuzz.) I agree — it’s a great-sounding circuit, maybe BECAUSE it’s so minimal. That pedal sounds great. And the playing is amazing as usual. 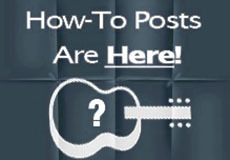 Good luck at NAMM! Joe, great pedal. Sounds great. Also like the very businesslike sliders, so you can tweak with the tip of your sneakers and dial in some tone without breaking a batswitch or something. Nice. like the sound, like the control schema. watching for this one to come out. I really like your pragmatic approach to pedals. They are great sounding and boldly go where no pedals have gone before, in that you aren’t limited to chasing the vintage mimicry that plagues so many other builders. They seem to have improvements made in such logical ways that arise from a real users perspective and experience, not someone trying to copy imperfect old ones. Joe! This is awesome man, I just stumbled on your page and am really digging your pedals. Definitely the filth! Love the design with the sliders, would be solid for a quick change on the go live or when you are jamming out, definitely a nice design touch. I recently did a review of some of the more main stream fuzz pedals, nothing special but just my thoughts on some of the ones out there. I am going to be doing a review on some boutique pedals soon and will hopefully be able to include this on there! Just wanted to say keep up the great work and really great design on the filth! $269 MSRP at Vintage King? Does one get a Starbuck’s coupon or some other form of trendy swag for laying down this kinda dosh ? I know COLA is high in the Bay Area but c’mon, $269! Really??? Pretty far reach IMO and I’ll be passing on this one. Sorry to hear that. It’s actually a pretty typical price for a US-made small-production pedal with a couple of expensive mechanical parts. True, it would be substantially less expensive were it made in China. Fair trade + fair wages + small business + local ingenuity + higher costs = higher MSRP. Worth every penny. Worth saving up for.